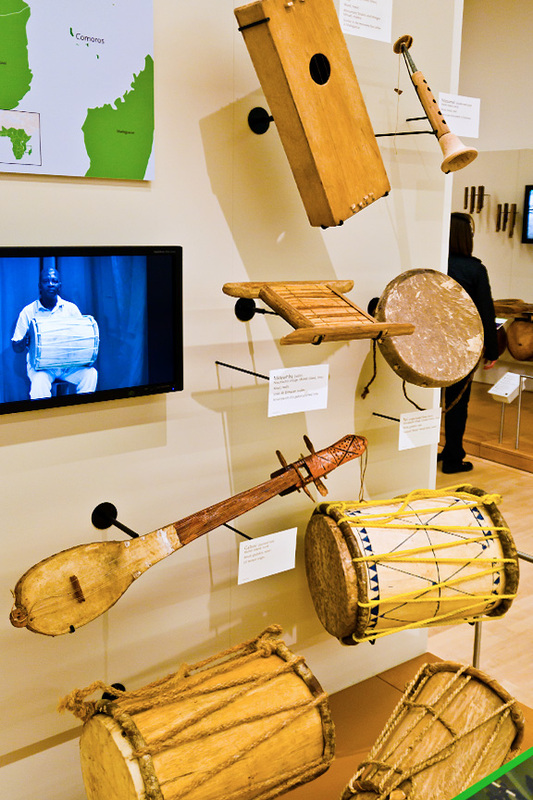 I climbed the stairs at MIM to discover another series of spectacular exhibit halls roughly organized geographically — the first with the musical instruments of Africa. 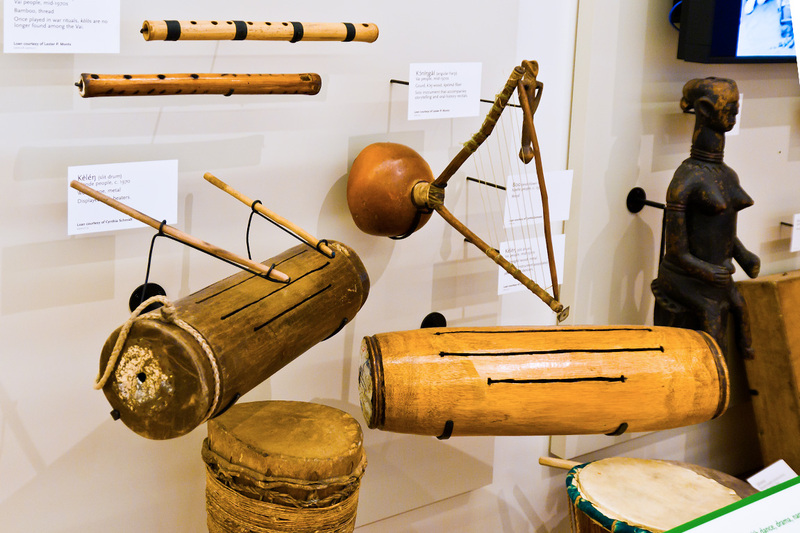 There is no way that I could provide you photos and description of every instrument on display — for that you will have to visit in person — but I will try to touch on most of the countries for which instruments were displayed. We start with Liberia. If you recall your history, Liberia was founded and colonized by freed American slaves with the help of a private organization called the American Colonization Society in 1821-1822, on the premise that former American slaves would have greater freedom and equality there. Slaves freed from slave ships were also sent there instead of being repatriated to their countries of origin. These colonists formed an elite group in Liberian society, and, in 1847, they founded the Republic of Liberia, establishing a government modeled on that of the United States, naming Monrovia, their capital city, after James Monroe, the fifth president of the United States and a prominent supporter of the colonization. 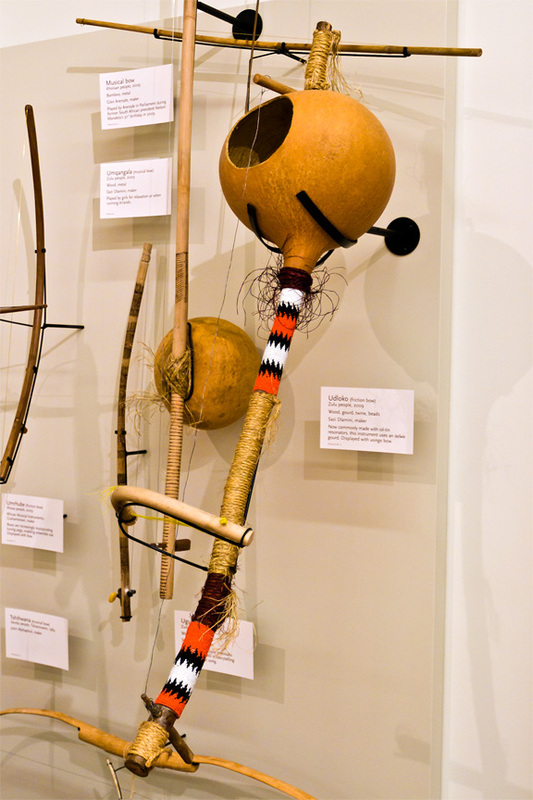 On display here is the keleng (the large wooden drum with slits), the conical sangba drum (bottom), kola (side-blown flute) and an angular harp. Next up is Comoros, an archipelago island nation in the Indian Ocean, located off the eastern coast of Africa, on the northern end of the Mozambique Channel, between northeastern Mozambique and northwestern Madagascar. I confess that I do not recall ever hearing of this island nation — but they have probably never heard of me either. 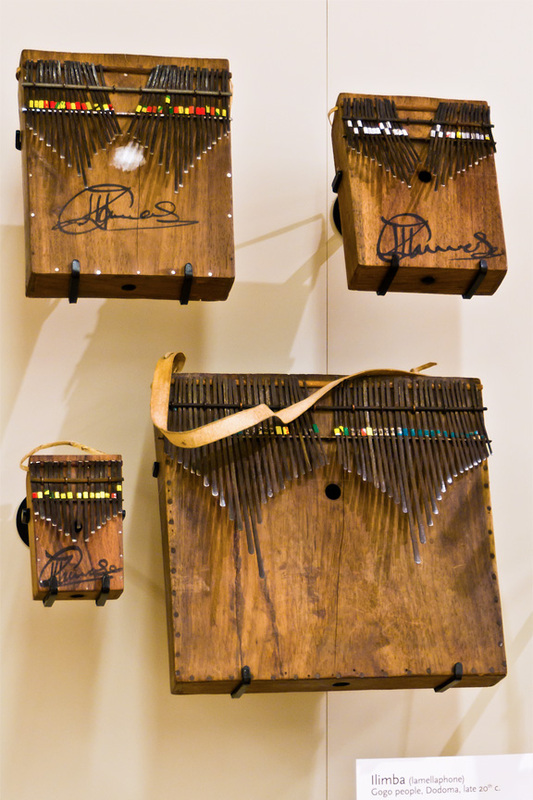 While the popular twarab musical style comes from East Africa, some instruments such as the dzendze box-shaped zither originated in Madagascar. The dzendze is often used in trance music and is frequently accompanied by the gabusi, a-five stringed lute also used in popular songs. 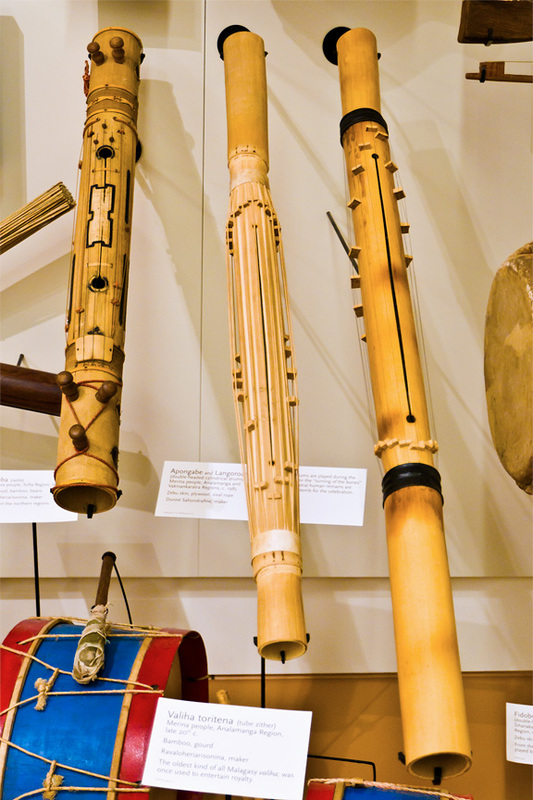 Another accompanying instrument is the mkayamba rattle. Percussion instruments include the tari, a circular frame drum that accompanies a sword dance of the same name. The rumba dori and msindio are drums of varying sizes that form an ensemble known as ngoma, commonly used in traditional Comorian music. 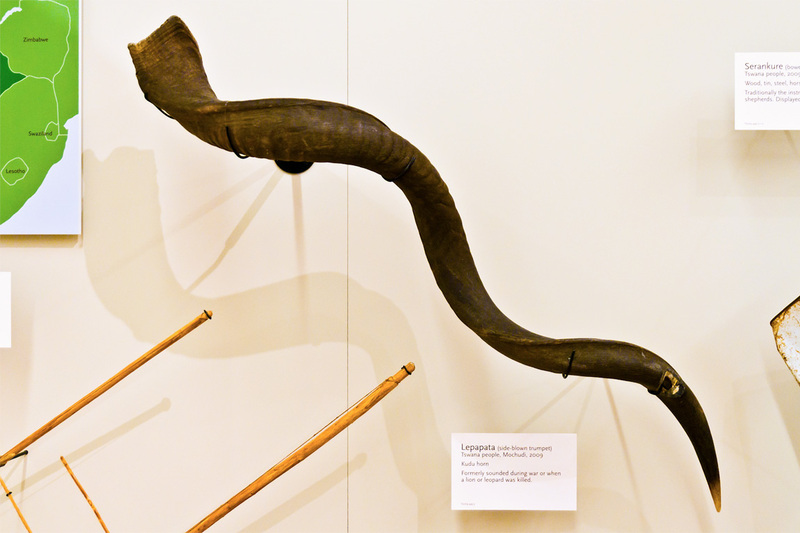 The ndzumara, a double-reed horn, has almost disappeared from use today. The unique valiha zither, of Indonesian origin, provides just one example of Madagascar's many musical influences, a result of its location off Africa's southeast coast. Today found throughout Madagascar, the valiha was once used in sacred rituals but is now played mainly to accompany sung poetry. Also from Madagascar, the jejy voatovo (stick zither) is made in much the same way as the European viol or violin. Its size can vary a great deal, reaching 50 to 80 cm in length. 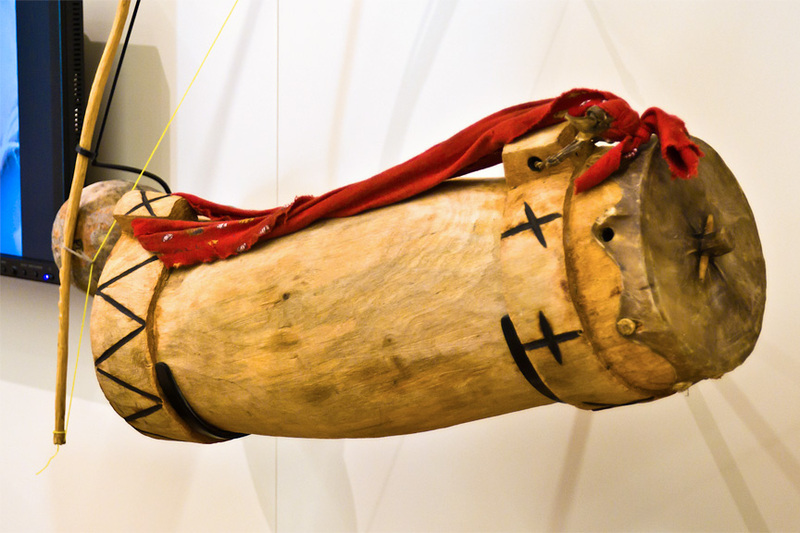 Its sound box may take several shapes, made either from a gourd or quite simply from an oil can. It was first played by the nobility and then abandoned to slave musicians. Today, zither players are still called mpilalao. Their musical repertory owes a great deal to the songs of popular entertainers. A musician on the outskirts of Antananarivo seems to have specialized in making zithers of this kind and played the jejy throughout the streets of the capital. Centuries of trading around the Indian Ocean created unique styles of coastal Tanzanian music, including taarab. It developed offshore on Zanzibar as court music for the royal Omani sultans but has absorbed influences from mainland Africa and beyond. Taarab orchestras include the Arabic oud lute, qanun zither (pictured here) and a range of European Instruments. 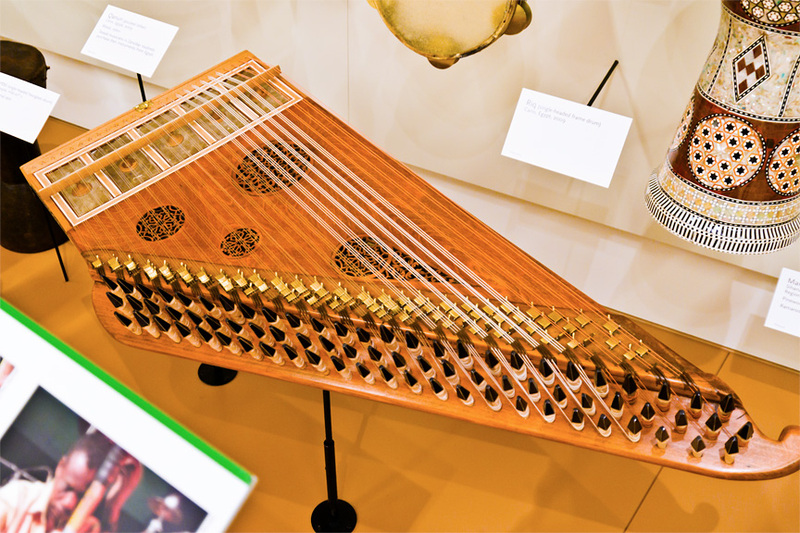 The qanun is a descendant of the old Egyptian harp, and is related to the psaltery, dulcimer and zither. I recall from my childhood that my family had a zither — but it was definitely child's play in comparison to this fine instrument. Also from Tanzania is this Ilimba (lamellaphone). It is a traditional instrument of the Gogo ethnic group and its most famous player in the 20th century was Hukwe Zawose, who developed a version of the instrument with between 66 and 72 metal keys. The instrument is similar to the Zimbabwean mbira but larger, and is tuned to intervals derived from the overtone series. 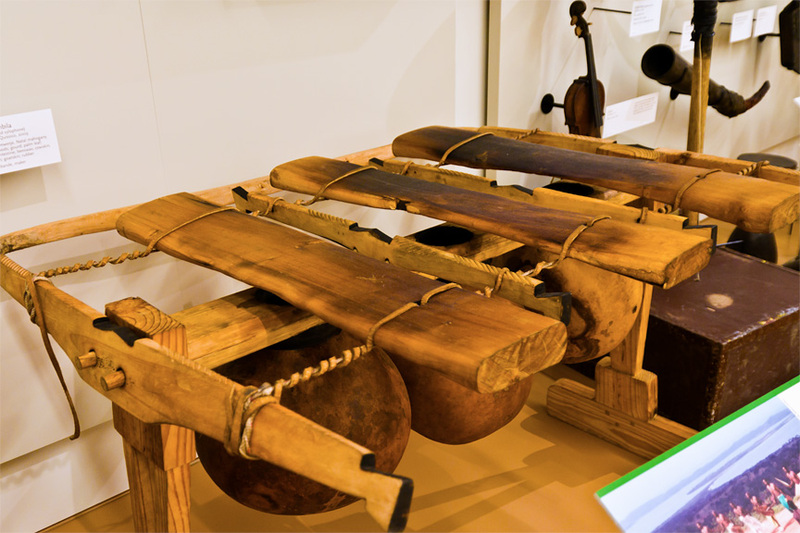 Early 16th-century Portuguese explorers and missionaries documented the great timbila (xylophone) orchestras played by the Chopi of Mozambique. The Portuguese were fascinated by the fresh rubber wound around the wooden beaters, years before Europeans became aware of rubber's uses. The mbila (singular of timbila) survives today thanks to its greatest 20th-century musician, Venancio Mbande. After large gatherings were banned by the Portuguese, Mbande trained timbila orchestras in exile in the Johannesburg mines for almost 50 years. Recognized as Intangible Cultural Heritage by UNESCO, the Chopi mbila is pictured on Mozambique's currency. The Njari mbira (lamellaphone) was made by the Shona people of eastern Zimbabwe and southern Mozambique. The interesting feature of this instrument is the gourd surrounding the "tongues" which amplifies and resonates the notes produced. I also like the decorative bottle caps fastened to the exterior of the gourd. Although Malawi's music is little-known outside of Africa, the country is rich with unique musical traditions. From the south, the giant valimba xylophone of the Sena is played by three men and is among the fastest xylophone traditions in Africa. 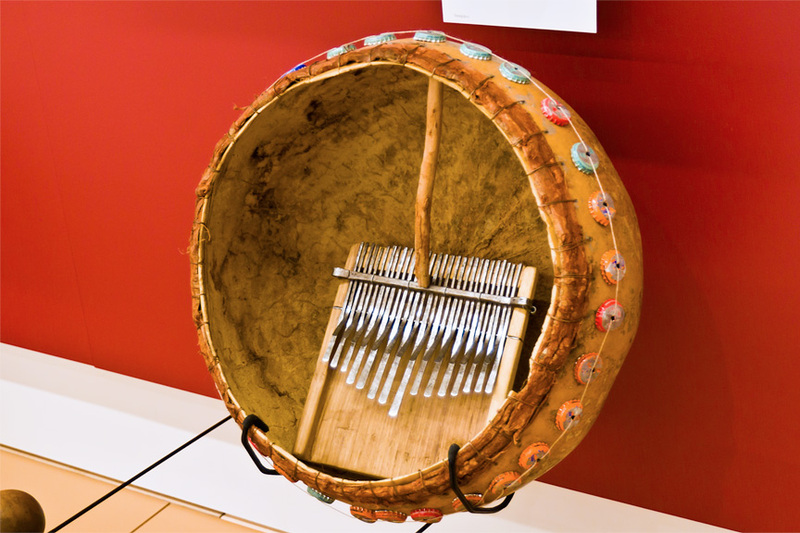 The musical bows, nyakatangale and zeze (pictured here), and the bangwe board zither illustrate the wide range of Sena instruments. Percussive music of the Amang'anja on the bacha drum, for example, is equally impressive. 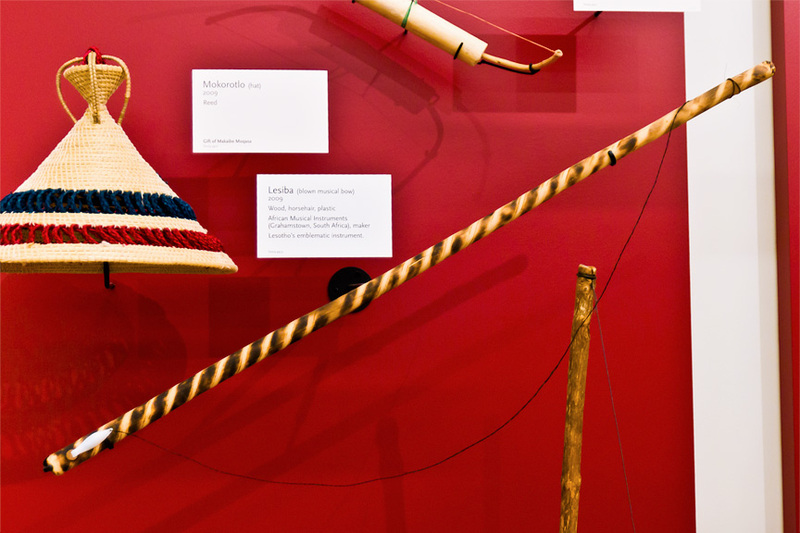 Lesotho's national instrument is the lesiba, a blown mouth bow played by inhaling and exhaling across a horsehair or feather. It is used to herd cattle and to accompany songs called linon. This one of the most unusual instruments I have ever seen. I wish I could have seen and heard it played. Since no one was there to demonstrate the lesiba, I just have to take guess on how music is created. You can see the feather at one end in the lower left hand part of the photo which appears to be attached to a cord. The player then blows (or inhales) at the feather, the oscillations of which would cause the string to vibrate. The player would use the bow (vertical stick to the bottom right) to provide tension on the string — the position would determine the resonant frequency of the string and thus the pitch. Or so I surmise. If you have a better idea, please let me know. The Zulu people are the largest ethnic group in southern Africa, numbering some 10-11 million individuals. 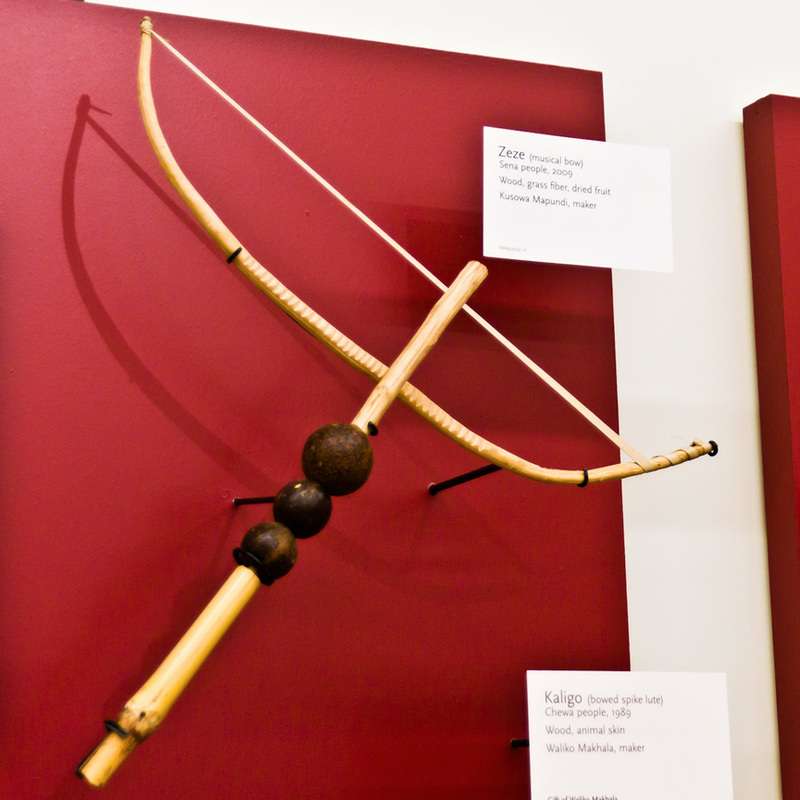 To the right is their udloko, a single-string friction bow. 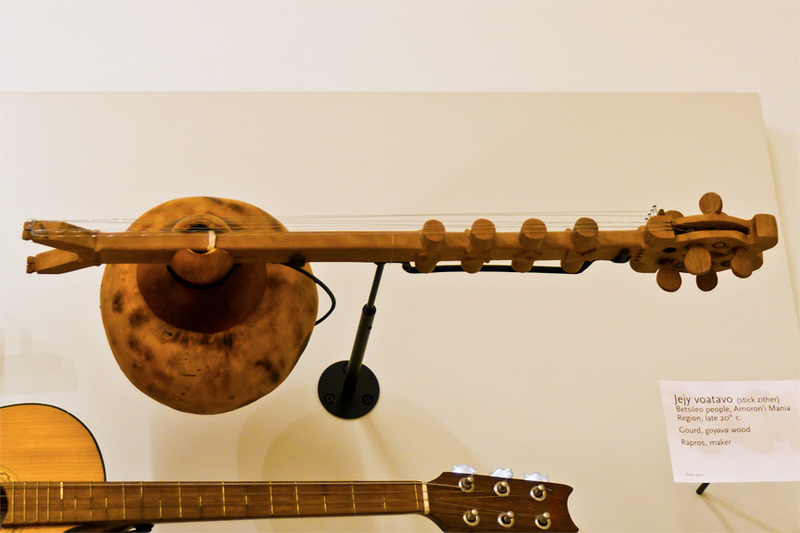 A gourd serves as a resonator (although new udlokos may be made with large cans) and a single wire string provides the sound when the bow (near the bottom of the photo) is drawn across the tuned single-string. It struck me that this instrument is analogous to a cello or bass — although upside down (from the western perspective). However, that places the resonator near the performer's ear, making it easier for him/her to hear what is being played. Pretty clever. Called the "Rainbow Nation" for its immense cultural diversity, South Africa is composed of its original settlers, the Khoisan; plus the Bantu, Nguni and Sotho peoples; European colonizers; and descendants of Asian slaves and immigrants. The nation's music is equally diverse. 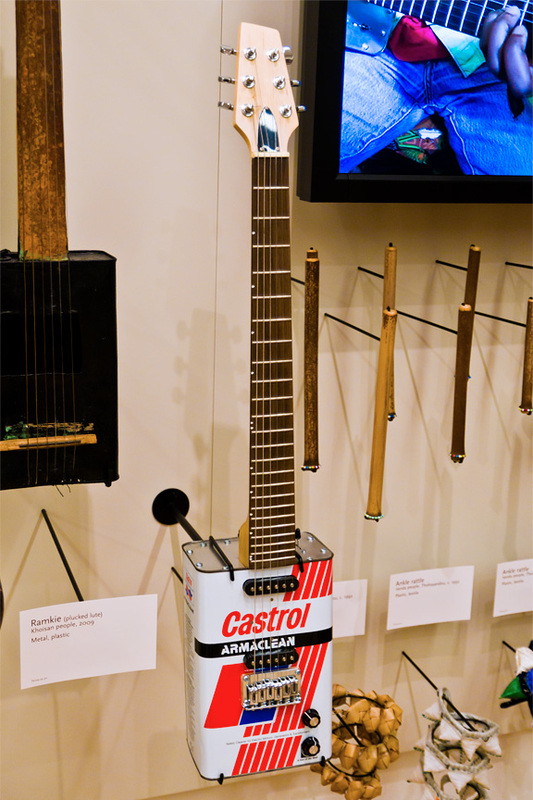 The instrument that caught my attention is called the ramkie an obvious imitation of an electric guitar. The television in the top right of the photo showed a musician playing a ramkie — which sounded exactly like an electric guitar. Ah, a drum, you say. But this is not a drum where the performers hits the head with a drum stick. This is a friction drum called a namalwa. To play it, a man takes some sodden grass in his hand and grasps with it the reed inside the drum (you can see the peg to which the reed is attached on the head of the drum). He then draws his hand back and forth on the strand of grass causing the head to vibrate with a deep, booming note — some say it sounds like the roar of a lion. The particular example is from the Mafwe people is south-eastern Africa. Botswana is home to several important ethnic groups including the majority Tswana as well the Pedi, the Kalanga and the San (formerly known as Bushmen). With such diversity, they have a wide variety of instruments but my favorite is the lepatata shown here — a side-blown trumpet. Formerly it was sounded during war or when a lion or leopard was killed. You may be familiar with its modern derivative — the vuvuzela that was sounded ad nauseam at the 2010 FIFA World Cup.